Paul was back on the bug today. 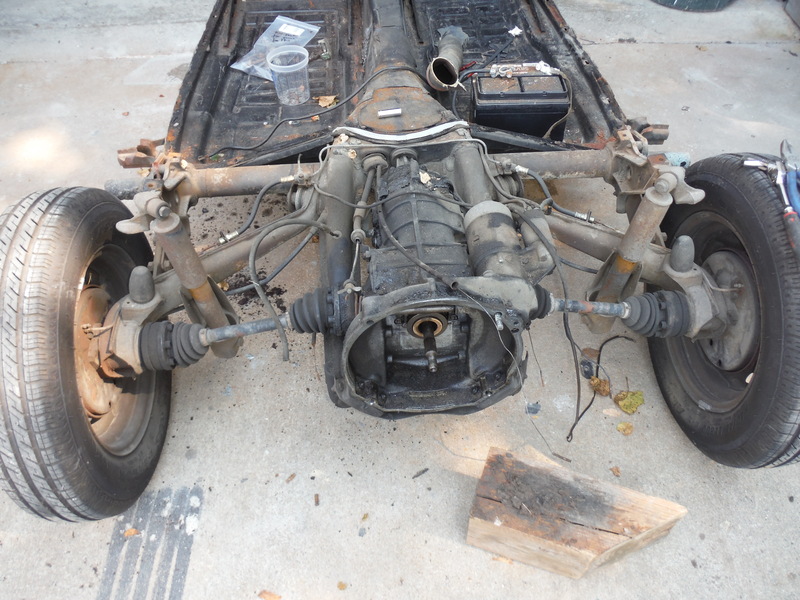 Last week he stripped off the e-coat and primed the fenders. The next day he blocked that primer out and fixed a few dents. The next day he primed the parts once more and then had time to prep the bottom side for epoxy and bed liner. Those steps were completed last Friday. So today he blocked them out one last time and prepped them for paint. He did have enough time to get them painted today as well. Lots can get done when things go smoothly and here is a fine example. These came out really nice. Tomorrow we will hang the fenders on the body but they wont quite be ready to fully bolt on. We are still waiting on a few rubber parts to come in. The fender beading is one of them. Yes, we are still here. We have been extremely busy these past few weeks. I have been taking a few pictures of whats been going on but just havent been able to post anything. A lot has been completed on the beetle since the last post. New pans are in, front beam support is in, new narrowed adjustable beam is in, new shocks master cylinder, all new brake lines, the body has been stripped and primed, pedal assembly has been stripped, painted and rebuilt and as you can see we have sprayed some Diamond Blue on the doors, trunk and deck lid. The body is currently at the metal fabricator getting its new heater channels in, new firewall and various other patch work done. We should be getting it back shortly and when we do we will jump on the body work to get it in final primer. As you can see things are moving. These old bugs are super cool and this one will turn out great. 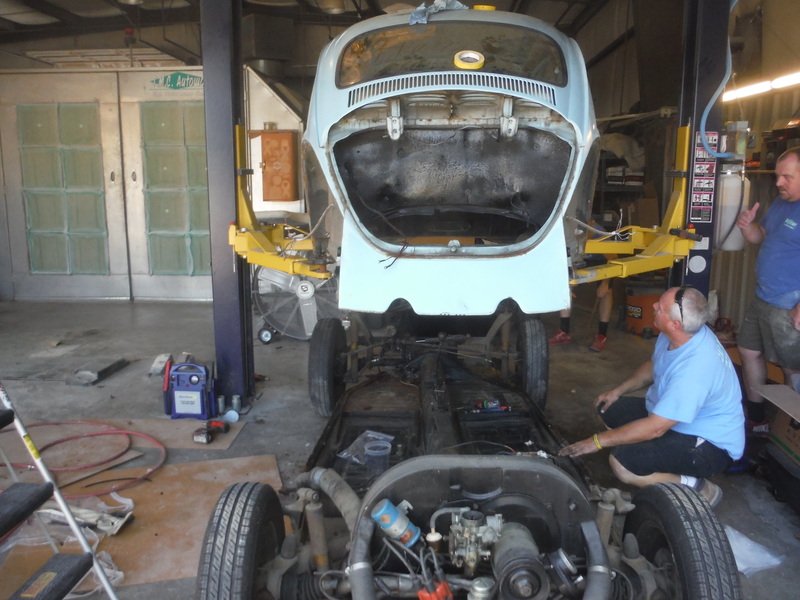 As you can see we have been making great progress on the ’70 beetle. 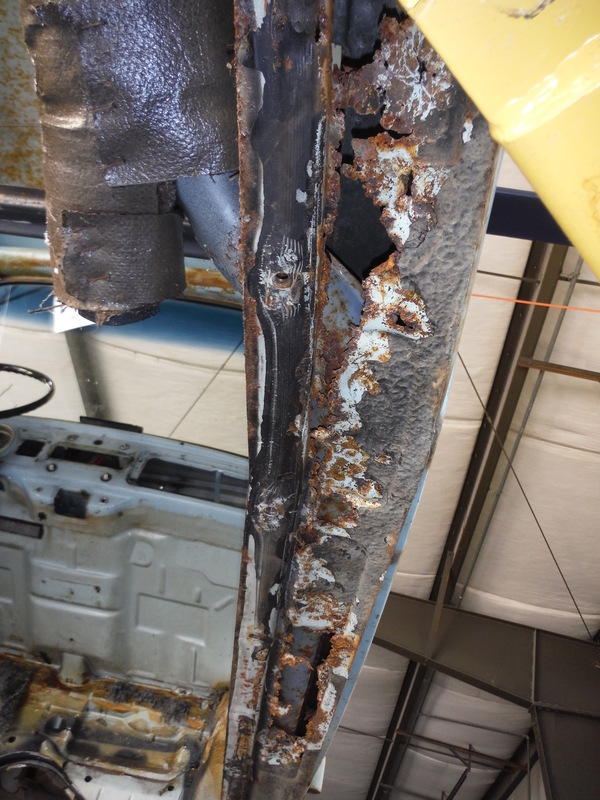 Unfortunately, our progress has revealed a few real rust issues. 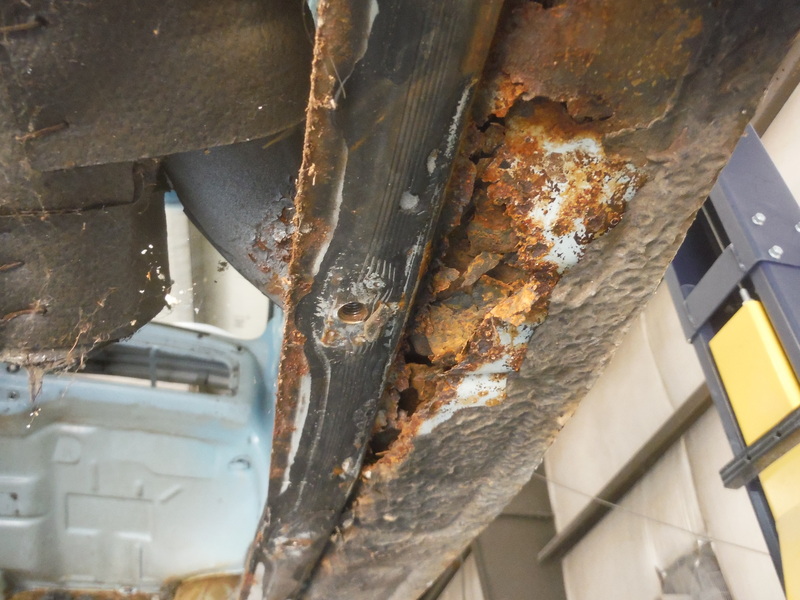 Some of these rust problems were caused by a leaky master cylinder and brake fluid resivoir others good ole fashioned water. Because the owner wants to keep this car for another 45 years we will replace all rusty parts and take all measures to keep it from returning. We didn’t have any issues separating the body from the pan and all of the pan bolts came out with no problems. Most of them however, were just about rusted in two so they will all be replaced as well. 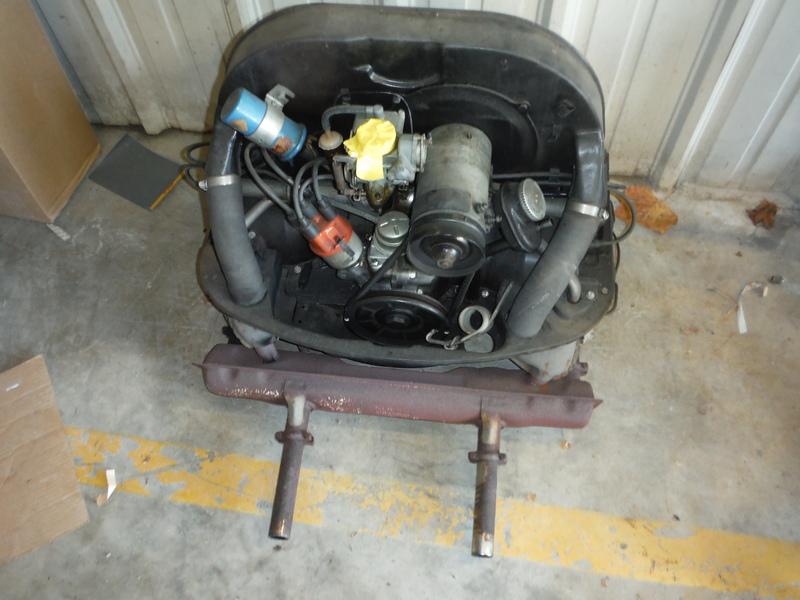 The engine was also removed so that we can more easily degrease the chassis. The engine runs well already so we will just clean the engine tins and paint them. Next on the agenda will be to remove the old wiring harness, windshield and back glass so we can get the body over to the blaster. 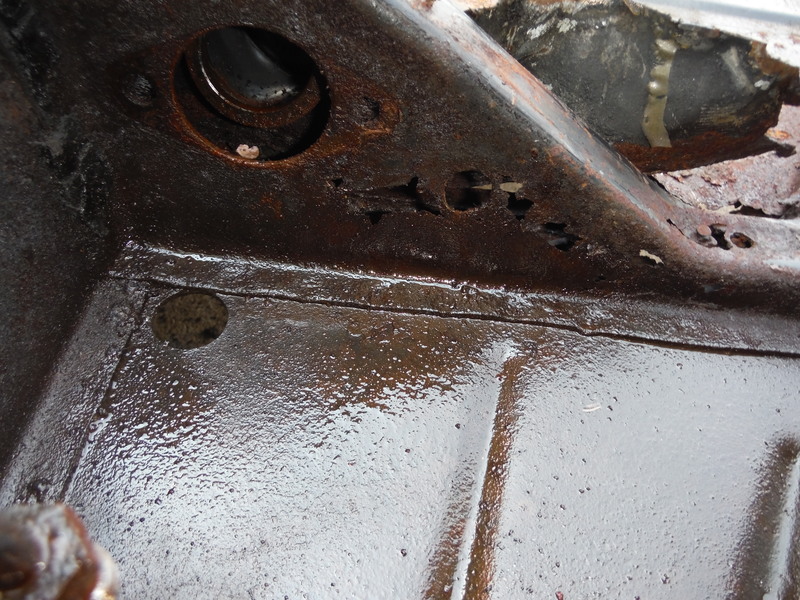 Once back from the blaster our replacement parts should be in so we can start rust repairs. Stay with us on this repair. We are looking forward to this project. 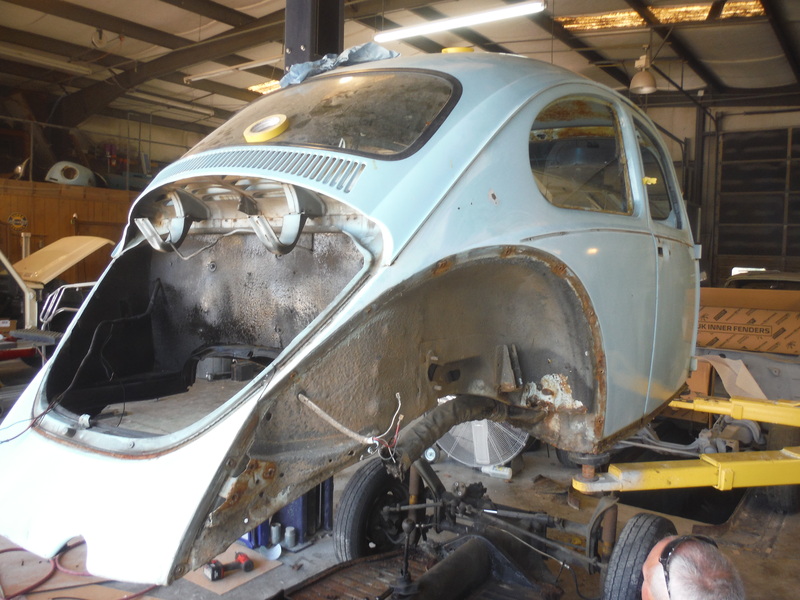 Our newest project is the this 1970 Beetle. It is a special build because this was the owners very first car, bought new when he turned 16. Although it hasnt been in any major accidents, rust has gotten hold of this little bug in a few spots. We will be repairing the rusty areas and freshening up the outside and inside with new paint, bright work, interior and suspension. The engine had a recent check up and got a good bill of health. As you can see we got right to work disassembling the car. We did get quite a bit apart on it and the rest will be apart next week. 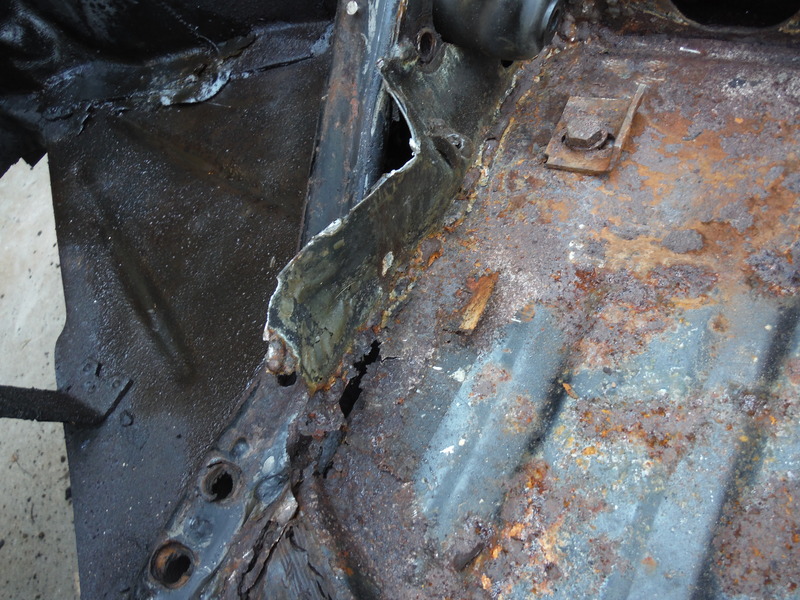 We will then start the rust repair and stripping off the old paint. This will be a bone stock restoration back to the factory color. Stay tuned to see the progress. 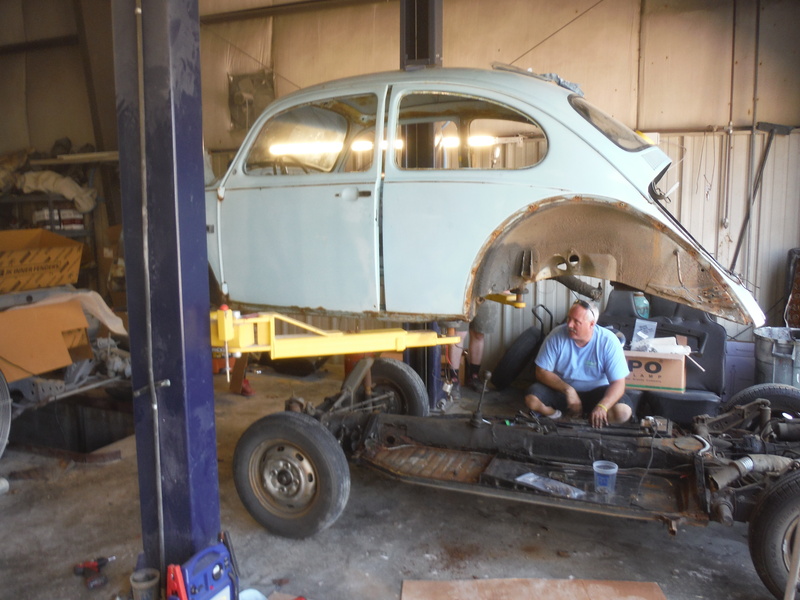 We started on this ’67 beetle a while back. 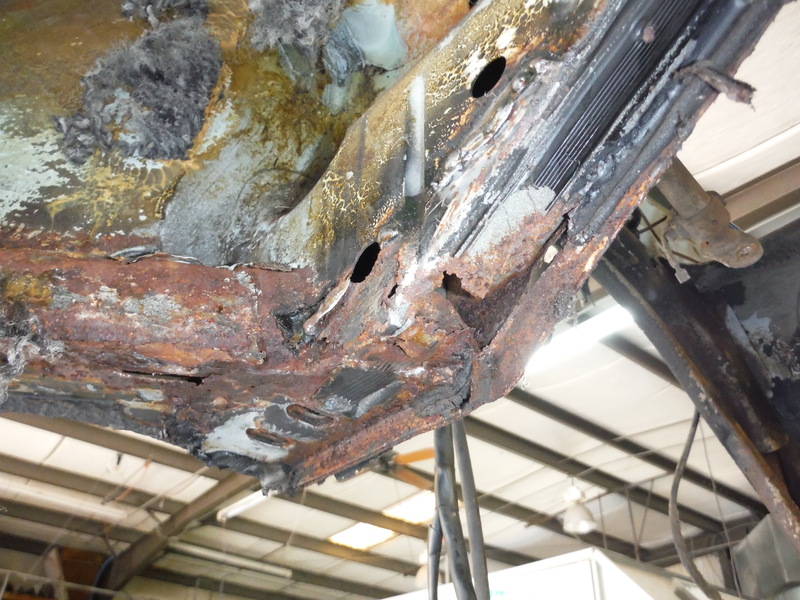 We had quite extensive metal work to perform as well as a full reassembly after painting it all over. Here are the finished shots of it. Its color is factory, zenith blue. The owner upgraded the wheels but left the car all stock. We had the interior done by a local shop in Burlington and they did a great job. The owner picked up this beauty Friday. I know he will have many good years of enjoyment.